The ship is the SS U.S.A.T General George S. Simonds, I assume a military ship??? 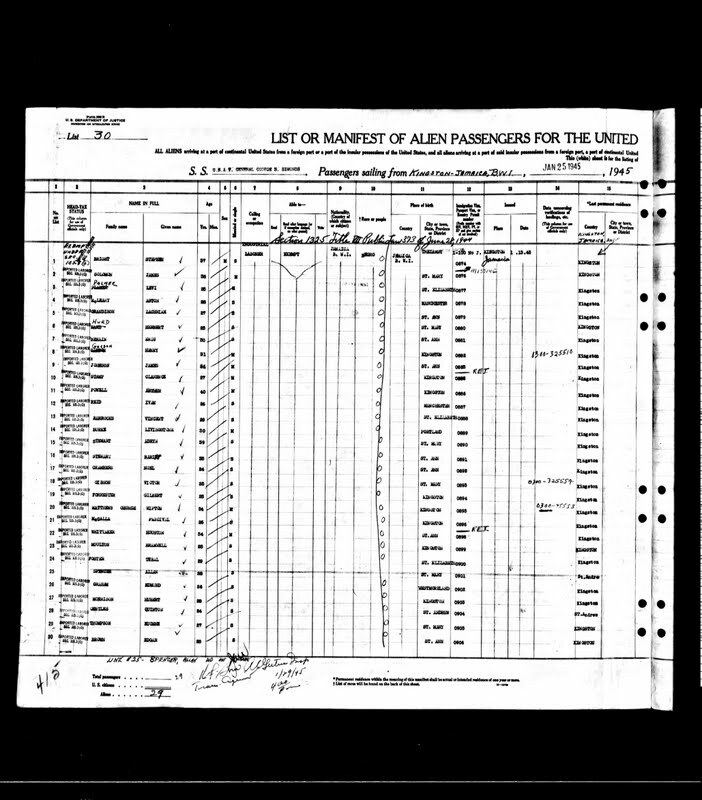 Under the column where the relative the person was going to visit is usually indicated, the passenger list states “War Manpower Commission, Washington D.C.” There is also a hand written note “Section 1325 title Vll public law 373 June 28, 1944”. Do you know why all these Jamaicans would have been brought to the US by the government in 1945? Why Jamaicans to US in 1945? It's not often we hear about the role of Jamaicans and our other Caribbean neighbors' role during WWII. Many Jamaicans fought with Britain, even though Britain granted Jamaica a new constitution that provided for limited internal self government in 1944; and, of course there were aliens who fought with the USA and allies; but, some contributions were less noted as they were overshadowed by war activities. In the midst of the WWII, the U.S. Department of Agriculture authorized temporary importation of 75,000 Bahamians and Jamaicans to work as farm laborers due to a shortage of needed workers. These legal aliens worked in south Florida fields, and in apple fields in NY, and in other east coast farm fields. It was a win-win situation. Our Jamaican neighbors were able to earn better wages, and the USA was in such dire need for laborers, so they even provided transport to the workplace. 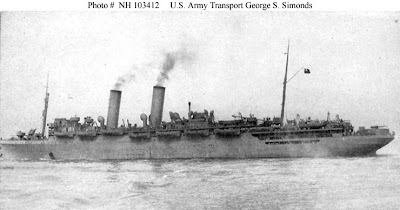 The USAT George S. Simonds, from August 1944 into early 1946, served between the Caribbean and the U.S. East Coast, mainly transporting Jamaican workers. The "Head Tax Laborer" example supplied by the reader is dated 25 Jan, 1945. Roll 2, Vessels--Aliens: May 12-24, 1945. Consists solely of Jamaican agricultural workers imported temporarily by the War Food Administration, Office of Labor, Atlanta, Georgia, aboard U.S.A.T. General George S. Simonds, on May 12, 18, and 24. The vessel passenger lists include both alien and citizen arrivals. The ports of departure included the British West Indies (including Jamaica, Bahamas, and Trinidad), Cuba, the Netherlands West Indies (Aruba), Canal Zone, and Honduras. Most were commercial vessels. 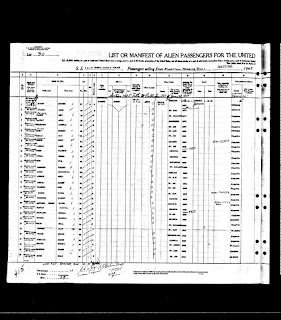 Included, however, on Rolls 1–3 are U.S. Army Transport (“USAT”) vessels carrying British West Indies (BWI) citizens (primarily Jamaican) imported temporarily as agricultural laborers by the Atlanta, Georgia, branch of the Office of Labor, a component of the War Food Administration. Administrative records relating to the temporary importation of Jamaican agricultural workers into the U.S. might be found in Records of the Office of Labor (War Food Administration), RG 224, as well as in Records of the Office of the Secretary of Agriculture RG 16. The functions of the War Food Administration (WFA) reverted to the Secretary of Agriculture upon abolishment of the WFA and its components, effective June 30, 1945, by Executive Order 9577.